Not the stuff of lurid pulp adventure, instead actual fact. The two wrongdoers were a fireman and an able bodied seaman. Stoker William Mintram inhabited a suitably Dantean inferno after the crime of killing his wife. He slaved in punishing heat to propel the souls aboard a White Star liner to a far-flung shore. AB George Francis McGough, on the other hand, sauntered the decks, almost rubbing shoulders with the passengers. Mintram died, carried down to the abyssal dark when the ship struck her iceberg. But McGough had the luck of the devil, joining the one-quarter of the crew who were saved. Both men took lives around the turn of the century, McGough in 1900, Mintram in 1902. Both were Southampton residents by the Titanic crew list, but one of the crimes was committed halfway across the world. Yet McGough got out of prison just when Mintram was going in – otherwise the pernicious pair might have been cellmates as well as shipmates. The Chapel district of Southampton at the beginning of the 20th Century. The famed White Star inn - and St Mary's steeple - shows this to be Chapel Road. The story begins when William Mintram married Eliza May Rose Veal in the summer of 1886, more than a quarter of a century before the Titanic sailed. Born in October 1868 in Southampton, bride Eliza was just 17 when she married. Her husband - who would become her destroyer - was but a year older. The young couple were likely forced by circumstance to wed. It is probable teenage Eliza had just found out she was pregnant – their daughter, named Rosina (perhaps “little Rose” after her young mother) was born early the following year. We next see William Mintram and Eliza May Rose in the records of the British census. It is 1901, and they are approaching their fifteenth anniversary. They are living at 63 Winton Street, St Mary’s (a Southampton parish), and now have five children. Rosina has been joined by a ‘little William,’ and the third offspring, like the first, has a name that echoes its mother, Eliza. Two sons have followed, Charles and George. But while ship’s fireman William Mintram proudly leads the list as Head of the family, his wife is almost anonymous – identified only by the initials ‘E. R.’ Nameless and seemingly little regarded, before the end of the following year she would be pronounced dead on admission to hospital. It happened shortly after her birthday, and she had just turned 34. 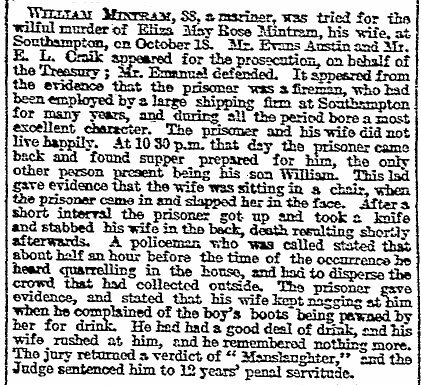 William Mintram, 33, a mariner, was tried for the wilful murder of Eliza May Rose Mintram, his wife, at Southampton, on October 18th . Mr Evans Austin, and Mr E. L. Craik appeared for the prosecution on behalf of the Treasury; Mr Emanuel defended. It appeared from the evidence that the prisoner was a fireman, who had been employed by a large shipping firm at Southampton for many years, and during all the period bore a most excellent character. 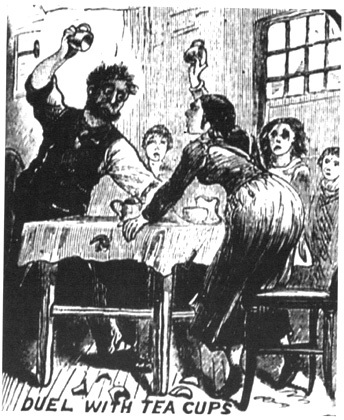 The prisoner and his wife did not live happily. At 10.30pm on that day the prisoner came back and found supper prepared for him, the only other person present being his son, William. This lad gave evidence that the wife was sitting in a chair when the prisoner came in and slapped her in the face. After a short interval, the prisoner got up and took a knife and stabbed his wife in the back, death resulting shortly afterwards. A policeman who was called stated that about half an hour before the time of the occurrence, he heard quarrelling in the house, and had to disperse the crowd that had collected outside. The prisoner gave evidence, and stated that his wife kept nagging at him when he complained of the boy's boots being pawned by her for drink. He had had a good deal to drink, and his wife rushed at him, and he remembered nothing more. The jury returned a verdict of Manslaughter, and the judge sentenced him to twelve years penal servitude. The judge in this case was Mr Justice Bigham, later to preside over the Titanic Inquiry as Lord Mersey, President of the Wreck Commissioner's Court. William Mintram must be considered lucky. Nowadays someone who stabbed a defenceless person in the back, occasioning death, would most often be considered guilty of murder, no matter what the provocation. Nor is intoxication any defence. But there is considerable empirical evidence that juries were often reluctant to convict of murder when it was a capital offence, with a mandatory sentence at the time of death by hanging. To convict William Mintram of murder would have meant handing his five children a life sentence of growing up as orphans. Instead, convicted of manslaughter, he served just three years in prison. Eldest daughter Rosina, who was named after her mother (and, as a foetus, the probable begetter of that marriage), would go on to similarly marry a ship’s fireman. She exchanged vows with Walter Hurst in Southampton in 1907. Rosina was aged 20, slightly older than her mother had been when she wed. William Mintram, two years out of prison, might have found it awkward giving the traditional speech by the father of the bride. A few years later, William Mintram Jr, who in 1902 had been the sole witness among the children to his mother’s slaughter, abruptly emigrated to Canada. He would soon be joined by his brothers. By 1912, meanwhile, William Mintram was to be found living next door to his married daughter Rosina. Mintram and the Hursts lived at 15 and 13 Chapel Road respectively (see photograph above). 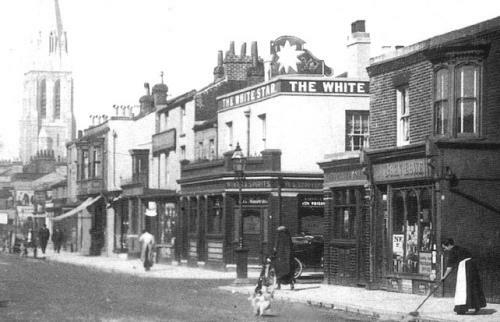 The White Star inn was just a stone’s throw away – perhaps appropriately, for not only did both men work for the White Star Line, but so too did Charles Hurst, the father of Rosina’s husband Walter (Wally). All three men were on the Titanic together. Of William Mintram, there is no account that fateful April night. But Walter Hurst said his father Charles, who was in the stokehold, threw a lump of ice onto his bunk and said: “Wake up, Wally, we’ve hit an iceberg.” So family lore would have it. Wally was the only one of the trio to come back. He jumped into the sea “about five minutes before the Titanic went down.” Somehow he was pulled into a lifeboat. Back in Southampton, the news emerged slowly. 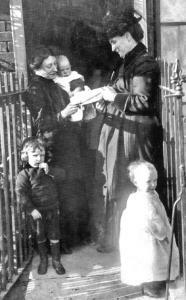 The Daily Sketch carried a photograph of Rosina Hurst, née Mintram, standing at the door of her house at 13 Chapel Road. In the caption, she is said to be learning of her husband’s survival – but also of the death of her father, which would render her parentless… ten years after it might otherwise have happened, had the jury’s verdict been different. The house next door would thereafter no longer contain the grandfather who doted on baby George, seen in Rosina’s arms. Nor would that infant see his paternal grandfather ever again. But Rosina would at least have her spouse come home. GEORGE McGough was a hard nut. To prove it, he appears in the 1901 census of Britain as an inmate at HM prison Winchester, fifteen miles from Southampton. This is the only George McGough in the entire census who was born in Ireland. The inmate is shown as having the career of mariner. George Francis McGough was born in Duncannon, Co. Wexford, Ireland, in 1875. His birthday, appropriately, was Bastille Day – named for the prison whose storming by the people has bequeathed the national day of France: July 14. McGough is shown on the census as aged 25. But eleven years later, aged 36, he is still claiming to be aged 25. 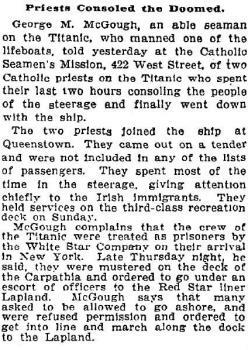 This time the age appears in the sign-on lists for the ill-fated RMS Titanic. Here AB George McGough is shown to be from Duncannon. It’s the same man – there was only one McGough family in Duncannon, and mariner George has preserved his youth, the better to sell himself at the hiring fair. Everyone did it – but photographs from 1912 show McGough to be well-seasoned and no stripling. He has long since seen the age of 25. What caused George McGough, sometimes known affectionately to his shipmates as ‘Paddy’ because of his Irish origins, to be banged up in Winchester prison? The answer was found on a website, uploaded earlier this year by Hugh McGough, and since verified. Material from that website is here repeated with the permission of its owner. 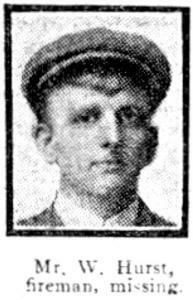 It shows that on March 10, 1900, able-bodied seaman George Francis McGough (this time entered on the Ship’s Articles as aged 27!) engaged in a drink-fuelled fight aboard the dreary collier Rustington while that vessel was anchored off Santos, Brazil. 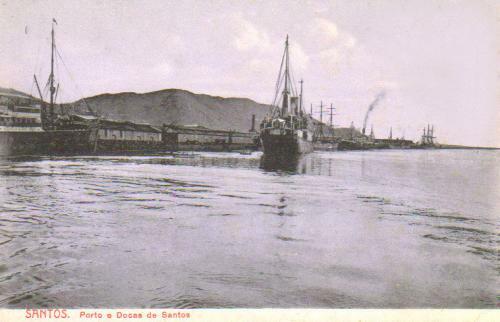 The scene of the crime – Santos harbour and docks, Brazil. 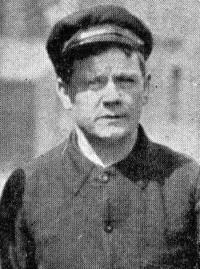 The fight was with another member of the ship's crew, Welshman John Dwyer, who appears on the articles as aged 39, but it is not for this reason alone that it was anything but a fair match. Dwyer was shoved over a hatchway – and felling headlong into the hold, dashing his brains out on the tough timbers some 26 feet below. Like Eliza May Rose Mintram, he may even have been initially struck in the back. Thrown Down the Forehold at Santos. Information has just reached Barry of the alleged murder of a man belonging to, and well known in the town, and we are able to give authoritative particulars of the tragic occurrence. The Steamer Rustington belonging to Messrs. Ball, Symonson & Company, of Fenchurch Avenue, London, sailed from Barry Docks on the 25th of January last with a cargo of coal for Santos, having previously shipped a crew at Barry. The Master had amongst his crew, two Barry men — one named John Dwyer aged 39, of Thompson Street, Barry Docks, a well known boarding-house keeper, whose name appeared on the ships articles as an AB; and the other named George McGough, aged 27, a native of Duncannon, Scotland [sic], also an AB; and well known at Barry boarding-houses. It appears, from a letter written from Santos by the Chief Engineer of the Rustington on the 13th. 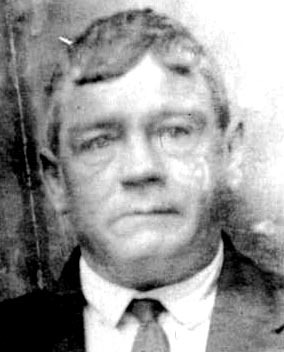 March, and received by Mr William Dwyer, eldest son of John Dwyer, on Wednesday morning last at Barry Docks, that on the previous Friday, March 9th, the two men, Dwyer and McGough had some words on board and McGough, it is alleged, seized Dwyer, and whether deliberately or not it is not yet known, threw him down the forehold of the ship, Dwyer falling on his head, and death resulted shortly afterwards. The deceased, John Dwyer, leaves a widow (Mrs Mary Dwyer, who keeps a seamen's boarding house in Thompson Atreet, Barry Docks,) and seven children, the oldest of whom is only about 20 years of age. 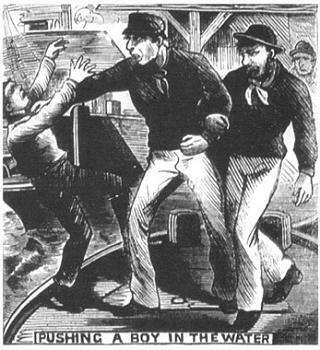 Amongst the crew of the Rustington is a brother-in-law of the deceased man, named William Burnett, a donkey man, but he was too much upset by the tragedy on board to write to his sister at Barry, and the Chief Engineer kindly did so in his stead, directing the eldest son, William Dwyer to break the shocking intelligence to his mother as gently as possible. The surviving Crew Agreement for the voyage shows McGough was formally discharged from the ship three days after the killing, and the notation ‘under arrest’ was entered against his name. It is likely he was taken off in the same tender as the shrouded remains of his victim. John Dwyer was buried on the Santos shore. McGough was handed over to the British Consul, who gave him in charge to the Captain of the Royal Mail Steamship Company ship Magdalena, to be brought to Southampton, the vessel’s home port. The Magdalena eventually made port in Southampton, and Detective Sergeant Edgar Tribe went on board to make the arrest. It was said that he bodily picked up Dwyer and flung him down the forehold, a depth of 26 feet. The prone man was found to have blood steadily haemorrhaging from his mouth and both ears. He died within a few minutes. Hugh McGough has uncovered records in the National Archives at Kew relating to the criminal trial at Winchester on Thursday, June 28, 1900. They show that Det Sgt Tribe gave evidence of arrest, caution and charge, while further evidence was given by Rustington crew members Walter Greeley, Johan Lundberg, George Burton, and Gustave Nillson. At Winchester Assizes on Monday, Geo. Francis McGough was convicted of manslaughter on the high seas, and sentenced to fifteen months hard labour. 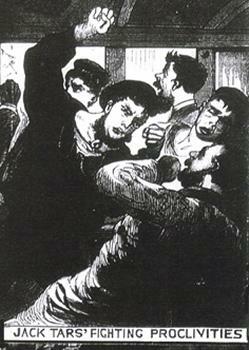 While the Steamer Rustington, from Cardiff with coals, was at Santos on March 10th, McGough, who was intoxicated after being ashore, wanted to fight, and fastened on Dwyer, whom he butted in the stomach, and, as alleged, threw him over the hatchway into the hold, twenty feet deep, causing death. The defence was that the affair was accidental. After hearing all the evidence the Judge, one Mr Justice Lawrence instructed the jury “that there was no case of murder made out,” even though it is a precept of the law that a person can be presumed to intend “the probable and natural consequences of their actions.” Here, unlike the later Mintram case, there wasn’t even evidence of provocation. 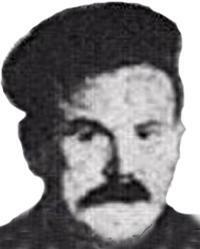 McGough, described in one report as “a diminutive but powerfully built Irishman,” was no doubt mightily relieved by the judge’s charges. He also had reason to be thankful to Havelock Wilson MP, for the Seamen's Union, who gave character evidence for McGough, even though he had almost certainly never met the man. The same Wilson was furiously active where the Mercantile Marine was concerned. He represented the Seamen’s Union on the ‘Lifeboats’ subcommittee of the Board of Trade, whose 1911 recommendations were shelved. So McGough went off for his short stint in jail – and was snapshotted by the 1901 census. When released, he returned to the old way of the sea, sometimes using the alias George F. Bergin, instead of George F. McGough. McGough’s alternate name, for which he held a separate Discharge A book, is shown on his marriage records – because the tough old seaman married a woman ten years his junior just before the Titanic sailed. Beatrice was the daughter of John Gannaway, a stevedore on the docks, and his wife Eliza, who had six other children and lived in York Street, St Mary’s. McGough signed on the Titanic and gave his address as 15 St George Street (since demolished), and his birthplace as Duncannon. No doubt Beatrice was pleased when he came rolling home. But there is a certain irony in an interview with McGough (described as “George M. McGough”) carried in the New York Times on April 20, 1912 before his return to England. You were a prisoner, George – you should know. The men were ordered to get into line and marched to the nearby Red Star liner Lapland, which in McGough’s mind was his new place of incarceration. 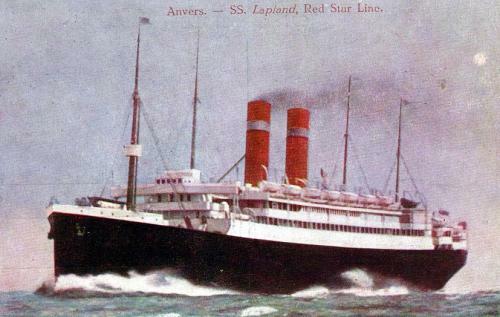 The Red Star liner Lapland, which brought most Titanic crew survivors home to England. Is it not odd, then, that George McGough later in his career went voluntarily aboard the Lapland as a member of her crew? A manifest for the Lapland, arriving at New York from Antwerp on January 15, 1920, discloses the presence of seaman George McGough, born at Duncannon, and with an address as 15 St. George Street, Southampton – the same street address he gave on the Titanic. McGough has a tattoo, is shown to be a ‘diminutive’ 5ft 6in tall, and weighs 150 pounds. The seaman's identification number on the manifest corresponds with a 1920 registration card showing George McGough as a bosun, born in 1875 at Duncannon, Ireland. 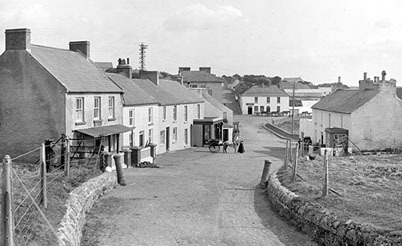 Further research has produced the above picture of McGough from 1920, courtesy of Southampton Archives, which establishes the fact that the man pictured in 1912 as McGough is once more George Francis McGough, born in Duncannon in 1875. His picture can be compared to the 1912 images to show that it is one and the same man - the Titanic AB. These records also show that McGough later served on the Llanstephan Castle, the H&W-built Briton, the Lapland, and the RMSP's Tagus - the vessel seen underway in the background in one of the Fr Browne photographs of the Titanic's departure from Southampton. There is a similar arrival from Naples on the same vessel a month later, followed by another in August on the Fort St. George. His age has crept backwards by a year, but he has gained a few inches in height. On April 24, 1922, George McGough sailed into New York aboard the Oropesa from Southampton. A year after he was 46, he is now 45. This time the Irishman is noted as having a scar on his cheek. Finally, Hugh McGough has found the name of the Titanic AB (indexed on the Ellis Island site as George McGouch) on the crew list for the Corbis, which arrived in New York from Tampico, Mexico, on November 19, 1924. There’s our killer - aged 50, Irish by race, British citizen, an able-bodied seaman of 5ft 4in and 140 pounds. They speak Portuguese in Lisbon – just as they do in faraway Santos, Brazil. Go to: "McGough the Key?" All illustrations supplied by the author. Census returns Crown copyright.